A snowmobile driver was killed in a recent accident after slamming into a parked vehicle, according to the Boston Globe. The Everett man was pronounced dead at Central Maine Medical Center. The accident is still being investigated, but officials believe that alcohol and speed may have been factors. Our personal injury lawyers in Quincy note in 2013 there were more than 144,000 snowmobiles sold worldwide; close to 50,000 were sold in the U.S. and more than 44,000 were sold in Canada. There are close to 1.5 million snowmobiles registered in the U.S., according to the International Snowmobile Manufacturers Association. On average, some 200 riders a year are killed in snowmobile accidents. In addition, snowmobilers around the country sustain close to 14,000 injuries each winter. These crashes are most often blamed on alcohol, excessive speed, and inexperienced snowmobilers. There are approximately 1,000 miles of groomed trails and another 1,000 miles of ungroomed trails in Massachusetts. -Never drink and snowmobile, just as you wouldn’t drink and drive a car. -You should slow down and always expect the unexpected. -Check the weather and ice conditions before heading out for the day. -Cross the road with care. -Avoid riding alone. Always travel with someone. -Always wear a quality DOT helmet and facemask. Wear layers of clothing to keep warm and dry. 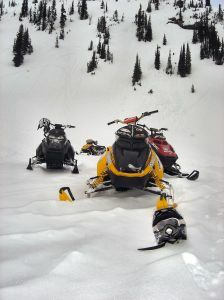 Snowmobile suits, bibs, jackets, gloves and mittens should cut the wind, repel water and keep you ventilated. -Be certain that all lights are operational and keep in mind that hand signals become increasingly more difficult to see as darkness sets in. -Keep headlights and tail lights on at all times. “Snow vehicle”, a motor vehicle designed to travel over ice or snow, having a curb weight of not more than 453 kilograms or 1,000 pounds, driven by track or tracks in contact with the snow or ice and steered by a ski or skis in contact with the snow or ice. -Know your abilities and understand the capabilities of your snowmobile. Every operator and every machine have different capabilities. Identify these levels and stay below them, and you are virtually guaranteed of having a safe and enjoyable ride. -A person under 10 years of age may operate an age/size appropriate snowmobile, 150 cc or less, while under direct supervision on lands on which the operator is domiciled. -You may not operate on someone’s land without their written permission. -You may not operate on lane with less than 4 inches of snow. – Snowmobiles must be registered through the Massachusetts Environmental Police. -Riders under the age of 16 ½ must be supervised by an adult when crossing a public way. -You may not operate a snowmobile in an improper, unsafe or unreasonable speed for existing conditions. -Each snowmobile must be equipped with an adequate muffler designed to reduce unusual or excessive noise and obnoxious fumes. -Each snowmobile must be equipped with and displayed after sunset, one or more headlights, a red rear light and red rear reflector. -Sleds or trailers attached to snowmobiles must have a red rear reflector. -Snowmobiles must be equipped with an adequate braking system.